2018 GCVCC Business Referral Directory is out, featuring CV Gen Next: The Next Generation of Valley Leadership and over 1,000 Member contacts. Enjoy and remember Members Shop Members first! Advertising in the many products offered annually by the Greater Coachella Valley Chamber of Commerce is a major benefit of membership. 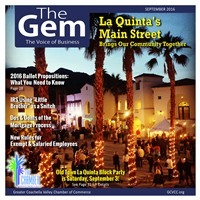 The GEM is distributed monthly to over 23,000 residents and businesses in La Quinta, making it the largest annual distribution of any chamber sponsored print product in the Coachella Valley. Additional opportunities such as the Annual Discover Indio Visitors Guide and our Restaurant and Attractions Guide are wonderful opportunities to get your business known. Click on the links below for more information, or contact The Chamber sales team at 760.347.0676. The Gem can also be found at www.TheGemLQ.com where you will find recent archives, ad rates and article guidelines.